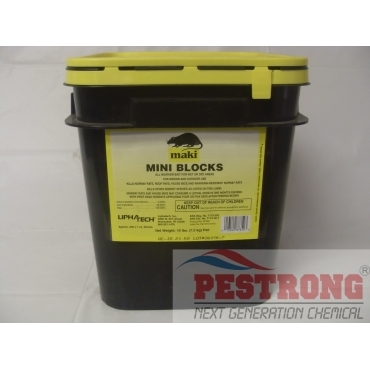 Where to Buy Maki Mini Blocks, Maki Mini Blocks Rat Mice - 16 Lb - $88.95 for Sale with Fast Free Shipping! Maki Mini Blocks Rat Mice - 16 Lb is a strong, reliable, high performing rodenticide bait contains the trusted and proven active ingredient, bromadiolone, and works in a single feeding. Best control for Norway rats and ideal for rotation with Generation or BlueMax. We are using these to try it out along with the Contrac place pack pellets. We know the Contrac works against rodents, but we want to try these out as well. I've been using generation mini blocks which worked good for a while, but it's getting less and less effective, and so I asked my friend in pest control business and he told me to switch out the poisons once in a while and so I tried maki mini blocks, and it worked just as well as the generation mini blocks.